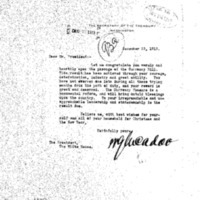 William G. McAdoo is writing Woodrow Wilson congratulating him on the passage of the Currency Bill. Let me congratulate you warmly and heartily upon the passage of the Currency Bill. This result has been achieved through your courage, determination, industry and great ability. You have not swerved one iota during all these trying months from the path of duty, and your reward is great and deserved. The Currency Measure is a monumental reform, and will bring untold blessings upon the country. To your irreproachable and unapproachable leadership and statemanship is the result due. McAdoo, W. G. (William Gibbs), 1863-1941, “William Gibbs McAdoo to Woodrow Wilson,” 1913 December 3, WWP18244, First Year Wilson Papers, Woodrow Wilson Presidential Library & Museum, Staunton, Virginia.